Heat oil in a handi or wok. Add cloves, cinnamon, cardamom, star anise and bay leaf. Saute a while and add chopped onions and green chilies. Fry till it turns golden brown and add ginger-garlic paste. Add mint leaves and saute a while. Add prawns, turmeric powder, red chili powder, coriander powder, curd and little salt. Cook it covered for 10 mins on low flame. Add 4 cup water and allow it to boil. 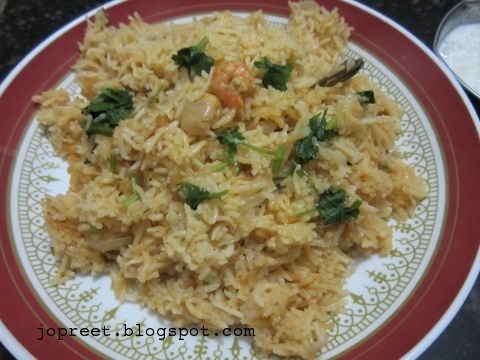 Add washed rice, lemon juice and salt to taste. Cook it covered for 15-20 mins. Garnish with coriander and serve hot with raita. 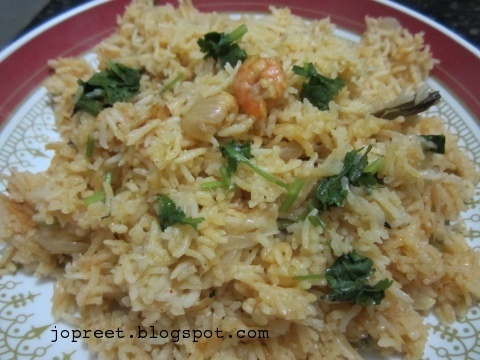 Prawn pulao looks perfect and delicious.